This charming and spacious country-style vacation residence has two bedrooms and two bathrooms and can accommodate up to eight people. 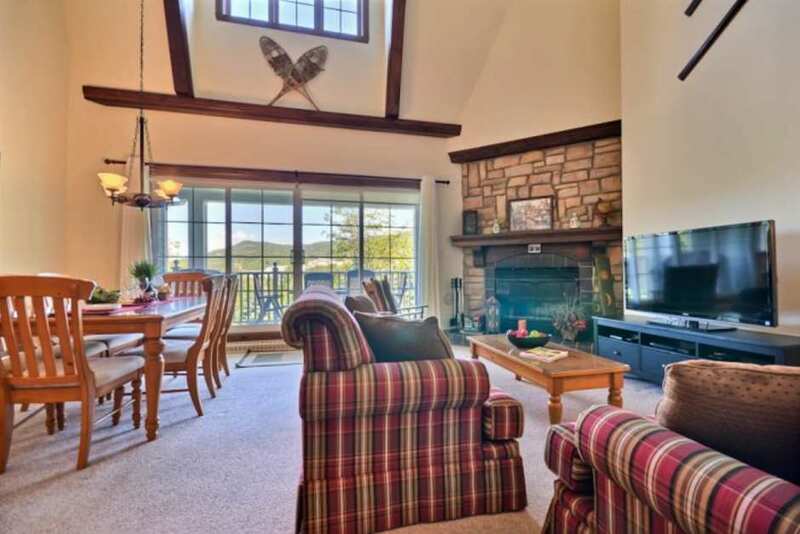 It’s the perfect place for a family getaway.The pleasant main room features a cathedral ceiling and wood-burning fireplace.The dining room, which has ample room for guests, opens onto the large balcony,where guests can barbecue in summer. The heated tile floors make the space even cozier in winter. The master bedroom on the second floor is furnished with a king-size bed and has a full bathroom. The second bedroom comes with a queen-size bed and dressers. Other conveniences offered to guests include wireless internet access, two HDTVs and a DVD player. I was extremely happy with Tremblant Sunstar and would definitely book through them again and even stay at the same place. It was very comfortable and exceeded my expectations. Thank you!